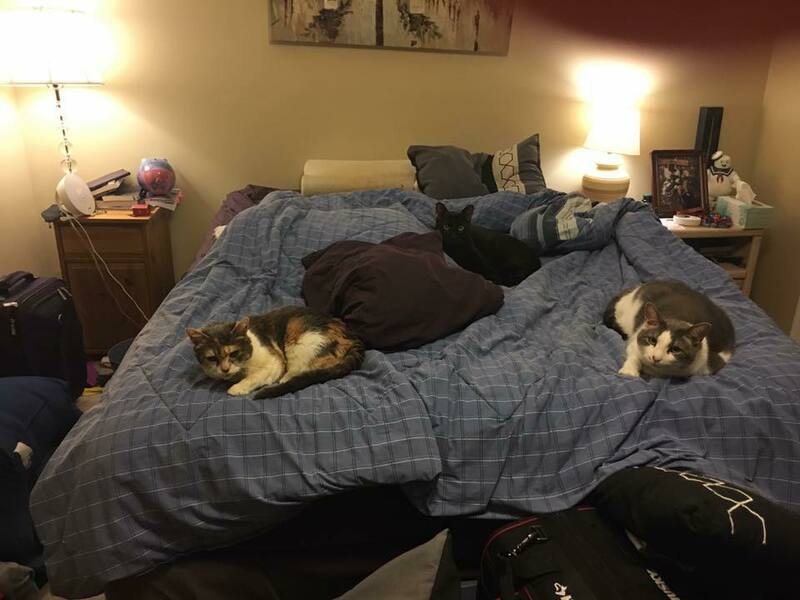 From left to right: Annabel, Jupiter (the black cat kind of hiding in the back), and Shay. So I want to blog more regularly, so I’ve decided to write about one of my favorite things: cats. I’ve recently discovered that what I want, more than almost anything else in life, is to be everyone’s Fairy Catmother, and help them find the perfect cat for them. I’d be like Santa Claus, only instead of presents I’d be delivering cats. But then I get into conversations like this. PERSON: I’m thinking about getting a cat. PERSON: But you know, I’m not so sure. I’m not really at a place in my life where I can have a dog, but cats as just so…aloof. I feel like this perception of cats must come largely from people who don’t have cats and haven’t been around them too much. A couple of things. First, cats come in all kinds of personalities, from very independent to ridiculously friendly. Mine have tended to be on the friendly side, because I (and later my husband and I) looked for that when adopting. Annabel, my 14-year-old girl who died earlier this year, was what I called a “chest whore.” If a stranger came into our house and spent any amount of time on the couch, she’d hop onto their chests and claim them as her own. Her favorite activities included lap-snoozing and aggressive face-rubbing. She used to try to stick her head into my mouth when I yawned, because apparently being near my face wasn’t close enough. But then there’s Jupiter. Jupiter is loving and affectionate. He’ll jump into my husband’s arms for hugs–which I wish I could catch on camera, because it’s awesome. He falls asleep on my legs a lot. His life revolves around being petted and played with…until a stranger comes in the house. See, Jupiter is terrified of strangers. And even when someone isn’t a stranger–like my brother, who stayed with us for a few weeks recently–he tends to be pretty standoffish with them. And that brings me to point #2: on average, cats seem to be less outgoing than dogs. Most–though certainly not all–of the dogs I’ve met seem to behave like everyone is their best friend, even people they’ve never met before. Cats, on the other hand, often tend to be more reserved around strangers. And why not? If you are not the person who feeds them, plays with them, or loves them, why should they be insta-friendly to you? You don’t go hugging strangers, do you? And this presents a challenge when adopting. If you’re looking for a cat who is friendly and affectionate–at least toward you–how can you tell when Fluffy clams up around strangers? Talk to the staff of the shelter or rescue. They’ll probably have a better idea of Fluffy’s personality when she’s more relaxed and comfortable. Don’t rush when you’re spending time with your potential new best friend; even shy kitties can start to warm up with a little bit of coaxing. Spend some time with Fluffy in her cage or enclosure before you take her to the “getting to know you” room–she’ll be more comfortable in her own space and you’ll be more likely to see “the real Fluffy.” Also remember that kittens, especially very young ones, may change as they get older. Once cats reach one year or more, their personalities become a little more stable.